Know How to Resolve "Cannot Start Microsoft Outlook" Error! Symptom of this issue is quite evident as it is thrown when you try to start Outlook application and the application hangs with this "Cannot Start MS Outlook" error message. Let us know more about this error, its causes and method to resolve it. Why Your Microsoft Outlook Won't Start? The most important reason for this issue, is corruption in Navigation Pane settings file i.e. –profilename.xml. In order to check whether this file has been corrupted or not is to check this file size. If its size is 0 KB, the profilename.xml file is for sure corrupted. The reason behind this sort of corruption is not known yet, but this type of corruption can affect all the versions of MS Outlook applications including Outlook 2003 to 2013. Some speculations are also made that this error is also displayed when the Outlook application is run in compatibility mode or if your profile belongs to an older Outlook version. It can also occur if the Outlook profile PST file is damaged or accidentally deleted and hence the application is unable to read the email file. It can be caused due to incorrect configuration or installation of the application. The reasons can be different, but eventually you need to find a solution for "Cannot start MS Outlook invalid XML" error. This error completely restricts you to open the application and also restricts you to perform any action in it. The emails also become inaccessible and you will be stopped from accessing any email or other data items. You can perform below mentioned methods to resolve this error issue. Go to Start Menu and type Run command. Another Run dialog will open. In case you are incapable of this command for resetting the navigation pane, you can also try to delete the navigation pane setting file. This process however is not recommended. 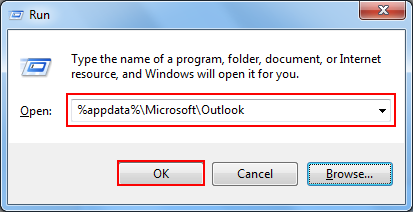 Type %appdata%\Microsoft\Outlook command in the run box and press Enter. It will automatically direct you to the location of the Microsoft Outlook configuration file. Find the Outlook.xml file and delete it. Note: It is highly recommended to recover this file first before you try to delete it. What if These Remedies Do Not Work? In case the error message (cannot start MS Outlook) still occurs while accessing MS Outlook application even after performing these remedies on Outlook profile, you can perform below mentioned steps. Create a new user profile on Outlook application. Try to start Outlook application in safe-mode. 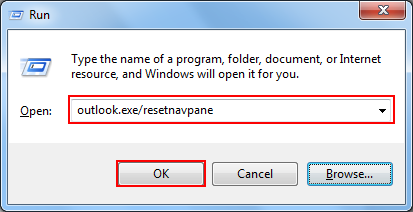 Repair PST file using ScanPST.exe utility. If all these methods fail to resolve your issue, there can be a severe issue in the Outlook application and you can go for a professional software program for resolving the error issue. Many online products like Outlook PST Repair are capable to resolve error messages by recovering complete data in new PST email file.